The power of marketing content lies in your brand authenticity. When prospective students and parents encounter your brand online, do they get the feeling that it’s you? Here are four questions to help you get to the core of who you are. Note: This post is part 2 of a series on the marketing conditions necessary for enrollment success. Click here to read the set-up to it all in part 1. No one sets out to write a blog, design a webpage, or map out a capital campaign strategy with the intention of hiding their school brand. 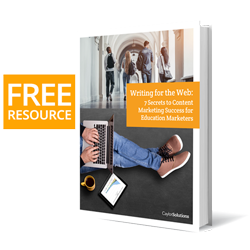 Yet so much of education marketing content you read or watch today feels generic — it feels as if it could have been created by any other institution. Generic is the term that we give to products that have no brand. Generic drugs are cheaper than brand-name drugs. Generic cereal doesn’t taste as good as brand-name cereal. Generic clothing doesn’t fit as well as brand-name clothes. Those are general statements. You may not agree with them. The opposite of brand authenticity is not brand deception — it’s brand genericness. The opposite of brand authenticity is being so bland, you’re indistinguishable from the rest. So how do you get to the place where your messaging is so clear, you’re shining brightly on the hill where your brand belongs? Authenticity begins when you have something to say — and you know what it is. Unfortunately, many schools have nothing original to say. Old, tired clichès canvas their homepages and print materials. Invest in yourself, intimate class size, dedicated to student achievement — all these may be true. But what do you have to say about your students, their world, and their future? What can contribute to the conversation around the areas of study that you have to offer? What unique perspective on the education experience can you present to prospective students? Many schools that we work with feel they have something to say. They sense that there’s something unique and wonderful about their school. They just don’t know how to express it in their marketing. This is where an outside marketing team can be a real help. Sometimes an expert on the outside can see the value in your brand that insiders just can’t articulate. You’ve got a unique perspective to share. You have valuable insights to bring to the discussion. But why are you in the discussion to begin with? What are the driving beliefs that motivate your institution? In his famous TED talk, Simon Sinek set out to prove that the most successful companies were those who knew their WHY and were able to inspire their customers to purchase their products or services because they believed in the WHY behind the company. Great companies, organizations, leaders, and great schools — they all start with clarifying with great certainty why they do what they do. The trick is to infuse every marketing campaign, brand element, and physical interaction with the purpose behind it all. Brand authenticity is grounded in your institution’s purpose, your WHY. Purpose or vision statements only stick to the wall, unless a great marketer like you makes it stick in the hearts of your target audience. The tone, mood, and mediums you use to communicate your perspective and purpose have a message in themselves for your audience. Is your tone bold, and “in your face“? Inspirational and exciting? Is it straightforward and all about the facts? Take the time to think and talk this through with the various stakeholders in your school. Pick your tone and mood, and stick with it in all of your marketing messages. Also, your brand colors, typography, web layout — even your website hierarchy — say something about you and how you approach the process of education. Sterling College in Vermont is one of the best examples of how an education brand has brought color, typography, design, and tone together with their what and WHY. Sterling College is a private, environmental college focused on the human relationship with the natural world and a place where what you do every day matters. Because we know that the most critical issues of our time involve our climate, soil, water, food, energy, and wilderness, Sterling offers environmentally focused bachelor’s degrees in only five areas—Ecology, Environmental Humanities, Sustainable Agriculture, Sustainable Food Systems, and Outdoor Education (or a program you design yourself)— to equip students for lives and careers that live up to their values. Immediately, you know why they are in higher education, what they have to say, and how they go about speaking their message. This is brand authenticity at its very best. Your brand has the power to attract the right students to your institution. It’s already in the ingredients of who you are. The beauty of what we do as marketers is in unearthing the authentic self of our education brand and presenting it consistently to our target audiences. Do you feel as though your brand is being marketed authentically? Are your institution’s purpose and personality shining through or are they covered under clichès and boilerplate templates? Revive your brand authenticity. Get ahold of us today for your free consultation!